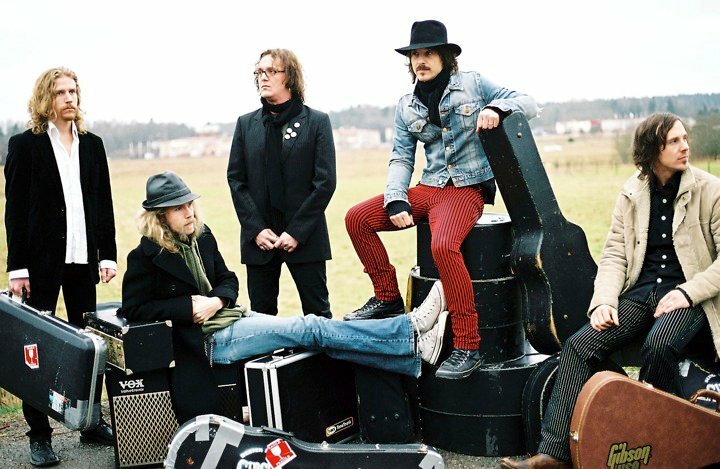 Dexter Jones’ Circus Orchestra was formed 2001 in Umeå, Sweden by Tia Marklund, David and Daniel Israelsson, Håkan Dalsfelt and Kent Jonsson. The debut record “The Losers are Back in Town” was recorded in 2003 and released by Freebird Records as a 7” vinyl. The album received extremely good reviews from stoner rock circles. The work with a fullength album started shortly after and the self titled debut (on Freebird Records) was presented in 2004, containing 10 dynamite songs. Slowly things started to happen. DJCO was booked at Eurosonic Festival January 2005 and toured mainland Europe twice, at times, together with the cult band Hypnos 69. The s/t got great reviews and was even titled ”the album of the year” by some of the leading European rock magazines. The songs could also be found on a few compilation records such as “The Ultimate fuzzcollection” (Fuzzorama Records). During 2006 some changes were made in the band. Kent and Håkan were replaced by Björn Billgren and Fredrik Jonsson and an already recorded EP, “Morbyn Outtakes”, was released in March, once again released by Freebird. To promote the EP, the Circus made two tours in USA. First of: the east coast, performing live, for the second time, in New York City. Moving on to the west coast, for shows in California and Arizona. After well-received shows in Hollywood, and San Francisco, they finished up the annual Stoner Hands of Doom festival in Phoenix, Arizona as the only European band. DJCO received stunning reviews for that show and back home in Sweden the buzz was growing and the band did close to 20 shows during fall 2006. In between tours in 2006 DJCO also managed to record a new album. Like the previous ones, the sessions took place at Ballerina Studios in Morbyn, Västerbotten, Sweden. The album “Side by Side” landed a new record deal with independent label Fuzzorama Records in January 2007. The record was released through Rough Trade august 2007 throughout Europe. Since then it..s been plenty of touring and 2010 is no different.